The Belton School District has seen hard times over the last couple of months, with four students dying in tragic circumstances. BELTON, Mo. -- The Belton School District has seen hard times over the last couple of months, with four students dying in tragic circumstances. "It's a matter of just supporting the students and talking them through their emotions, making sure they're okay, gauging the level of impact it's had on them," said Dr. Sara Jones, assistant superintendent of pupil services for the district. The district is preparing its counselors, staff and students for grief support yet again after losing two 16-year-old boys, Jacob Zimmer and Cody Langer, on Friday. The boys were hit by a car on Peculiar Drive. "Sadly, we have had to really provide this kind of support every year for several years for a variety of student deaths, whether it's accidental or even suicides," Jones said. On Aug. 14, Montana Lewison, who had just graduated from Belton High School in May, suddenly died in Minnesota. Just over a month later, on Sept. 20, 15-year-old Nicolas Brownell died. "After the incident a week ago or so, there were probably 30 to 40 students that the counselors were actively working with and talking to on those days," Jones said. The Belton School District has a grant from the Health Care Foundation of Greater Kansas City to provide free counseling services in school. Therapists are on-site in schools to help assess a child's need. When a tragedy happens, therapists from other departments within the district will come to the school and provide support for grieving students. If a student needs further support, the therapist can refer the student to an assistance program provided by the district. That student can get three free visits with a therapist. A student can also be referred to another therapist beyond the district if needed. "We saw a need for it to be more easily accessible," Jones said. "Their parents don't have to take off work, students don't have to miss school. They can walk down the hall, work with a therapist and then get back to class." On Sunday, Zimmer and Langer's devastated friends and family members honored them at a vigil. School administrators were also there to offer words of support. 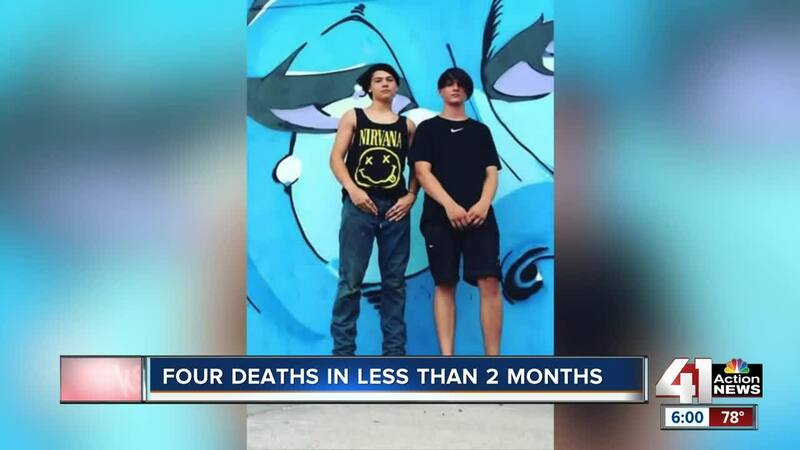 Police are still investigating the incident that took the boys' lives. Peculiar Drive is a poorly lit highway access road. Lt. Dan Davis of the Belton Police Department said the boys were walking in the roadway around 8:30 p.m. Friday when a woman hit the teens with her car. "There's nothing to indicate at this point that this act was intentional," Davis said. Davis said they are not releasing the woman's name because she hasn't been charged with a crime at this time. He said she has been cooperative and is answering investigators' questions.